Our first experiment involved ‘slow waves.’ Take a bottle, fill it 1/3 full with water, and add a drop or two of food coloring. (The kids were fascinated just by seeing the food coloring mix with the water, as you can see from the photo.) 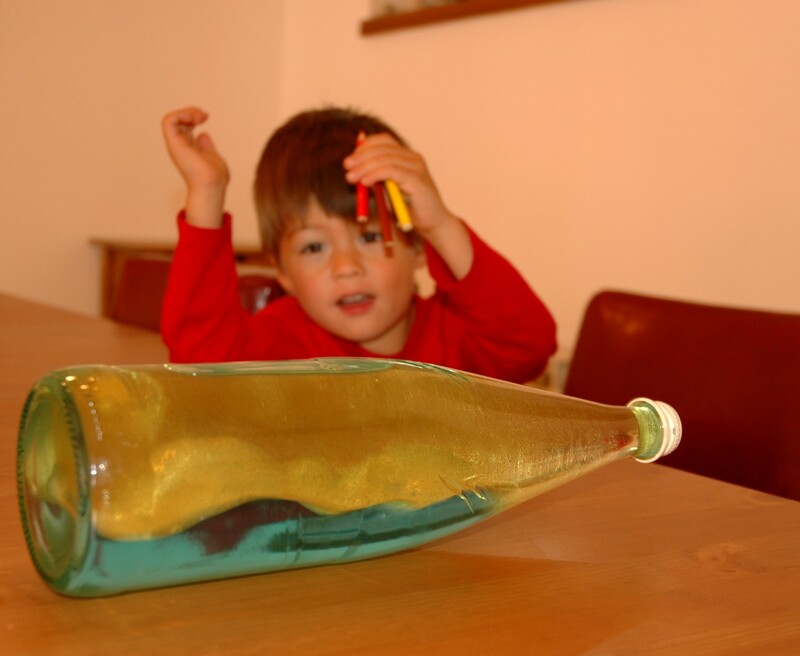 Tip the bottle on its side, and gently rock it back and forth, observing the motion of the waves inside. They travel rather quickly. Now fill the rest of the bottle with vegetable oil, and repeat the wave motion. The waves move much more slowly. Why? This is a cool demonstration of pressure on the motion of a liquid, and can lead to discussions of water pressure at depth (why objects are crushed at great depth), but mostly they’ll just tip the bottle, shake the bottle, invert the bottle so it looks like a Lava Lamp, etc. Great fun. Our next experiment involved simple water displacement. Half-fill a glass with water, add a few ice cubes, mark a line at the level of the water, and ask the kids what they think will happen to the level of the water when the ice melts. 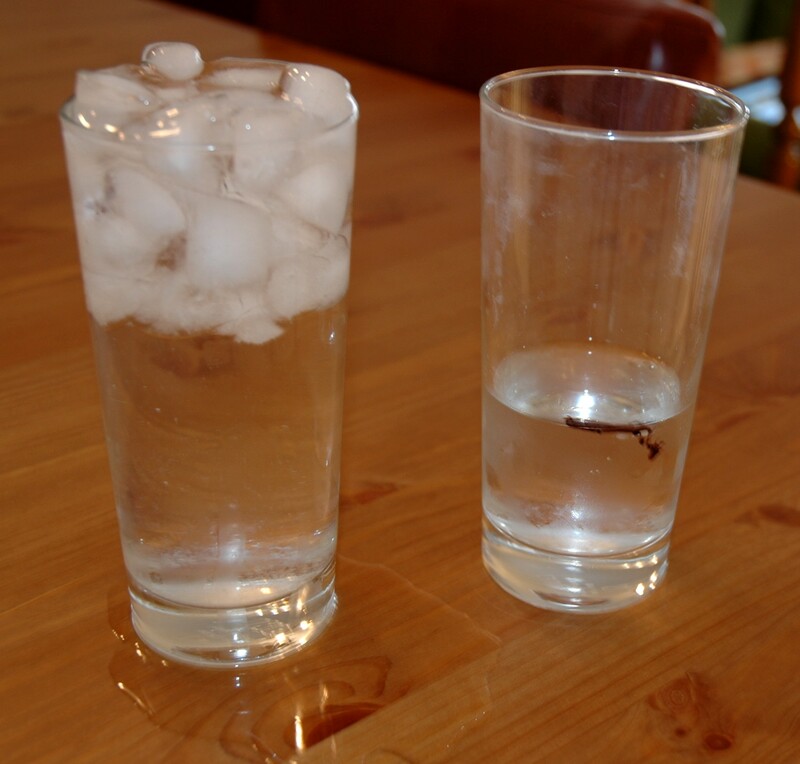 Now fill a glass with ice until the ice rises above the rim, and pour in water until it is so full that only the surface tension of the water is keeping it from overflowing. The kids will probably guess (correctly) that when the ice melts the water will overflow the glass. But do they know why? Our third experiment was more exciting for them. Take two bowls, and fill one with cold water, and one with hot water that you’ve just boiled. Cover the hot water and let both bowls rest a few minutes. Take your food coloring, and tell the kids you’re going to put a drop in each bowl. Ask them if they think the food coloring will react differently in the hot water than it does in the cold. They’ll probably answer ‘yes,’ because why else would you be asking, but press them for how it will behave differently. Dunno. Let’s see. The drop in the cold water spreads out very little, and drops in a globule to the bottom of the bowl. In the hot water, the food coloring disperses rapidly. Why? 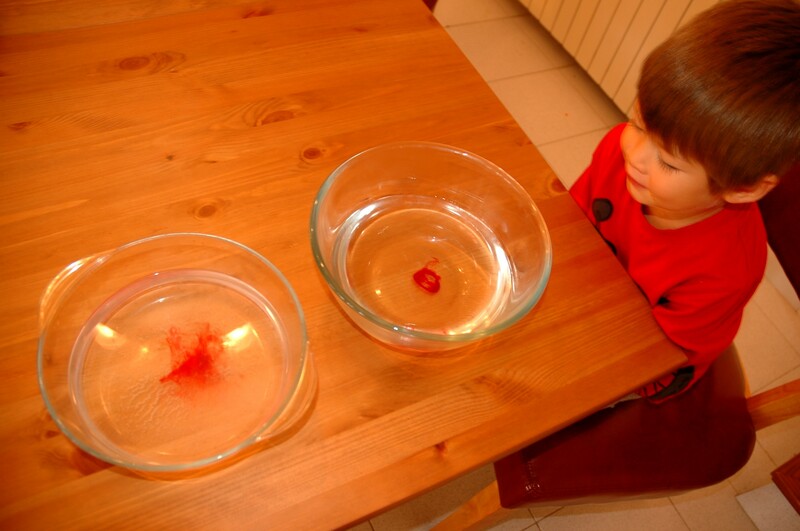 Our last experiment was probably the easiest, with the most immediate and impressive results. Take a balloon, and rub it on your kid’s hair. Everyone knows what happens next – you’ve created static electricity, and the kids’ hair will stand up when near the balloon. Pretty entertaining in itself, really. But again, they’ll probably just want to have fun bending the stream, so let them have at it. 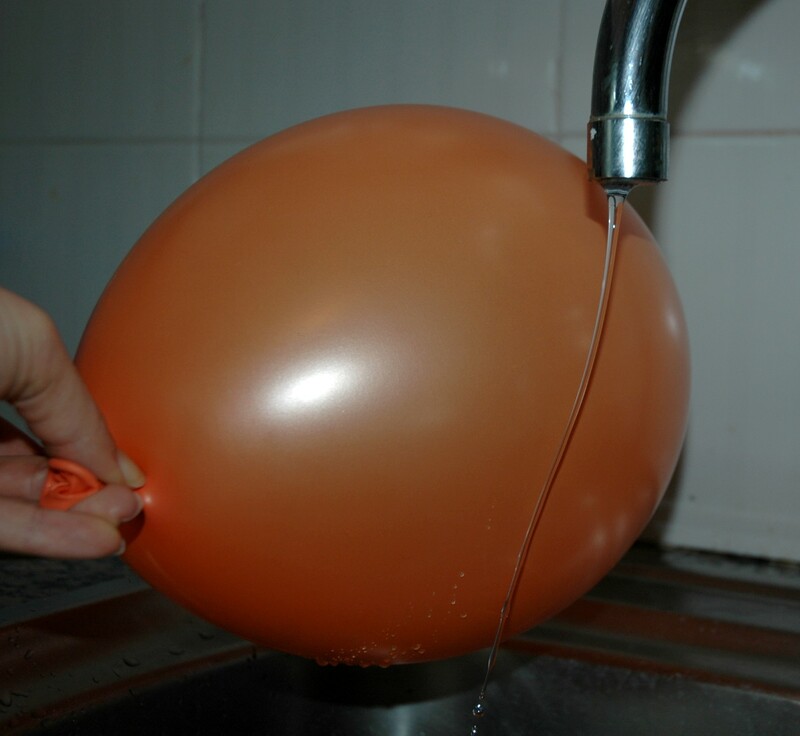 There are thousands of interesting experiments you can do with simple items you have on hand around the house. In addition to The Naked Scientists, try Science Kids, which also has fun topics and activities. Well, I’m dying to dissolve the shell of a raw egg in some vinegar, so I guess our next theme will be bases and acids. Can’t wait. Have fun with science! I have no kids yet but I like what you are doing. I always thought that I would do that too. 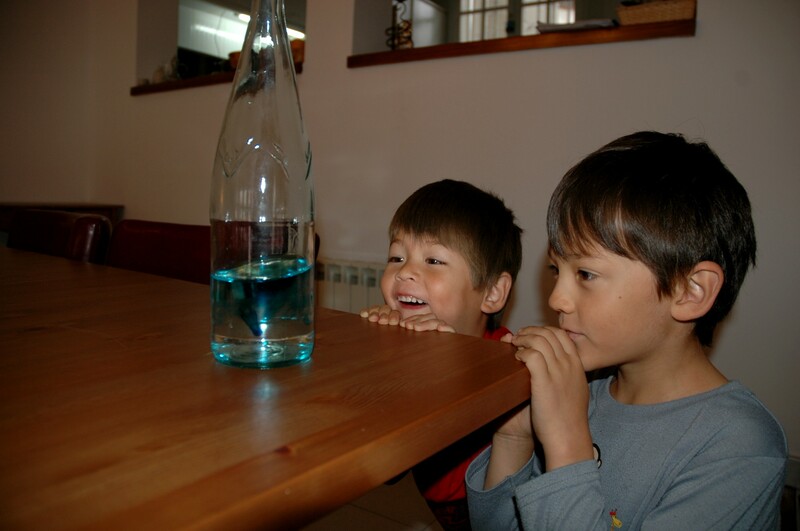 Playfully teach kids science. I believe that it can introduce them the way to science or to more questions which they want to have answered. That means it will teach them that “learning new things” is interesting. It maybe even could wake up new interests. these activities will keep the kids occupied for sometime. Great post!. Thanks, Ika. Stuff like this is great for rainy days!